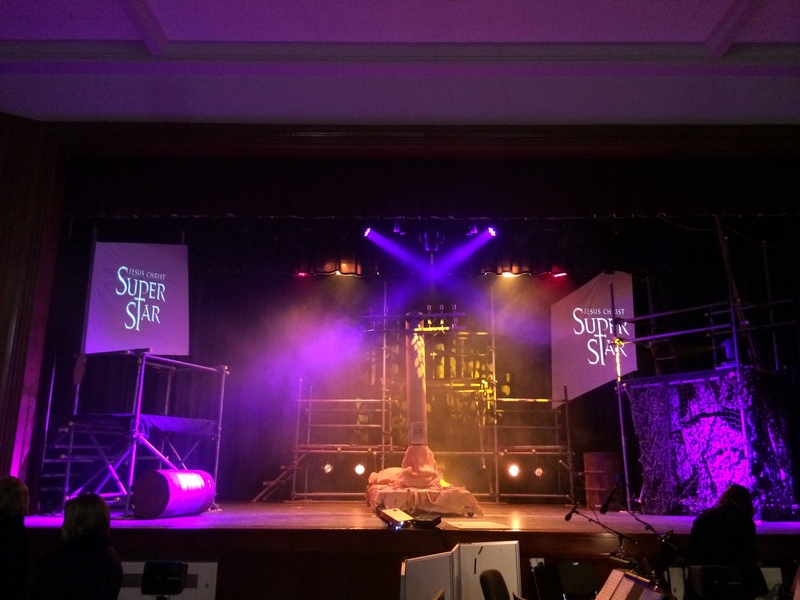 We are an award-nominated mobile entertainments service based in Kent. 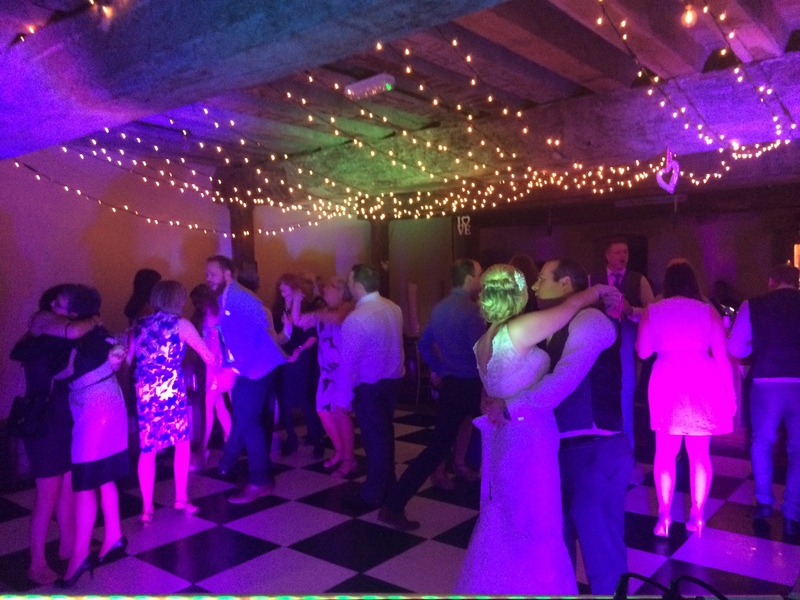 Welcome to the home of DISCO-TECH, a professional provider of mobile discotheque entertainment to Weddings, Birthdays, Corporate Events and Parties across Kent. We provide a personalised and friendly service and pride ourselves on the quality of our presentation and our attention to detail – We want your evening to look good and sound great! We are committed to playing the right music for your celebration and with the help of our very own Client Portal we offer you and your guests the driving seat to browse and choose your favourite songs as well as those you really don’t want to hear. Our continually updated music library comprises thousands of great hits from the past 7 decades including the latest chart releases being added every week. 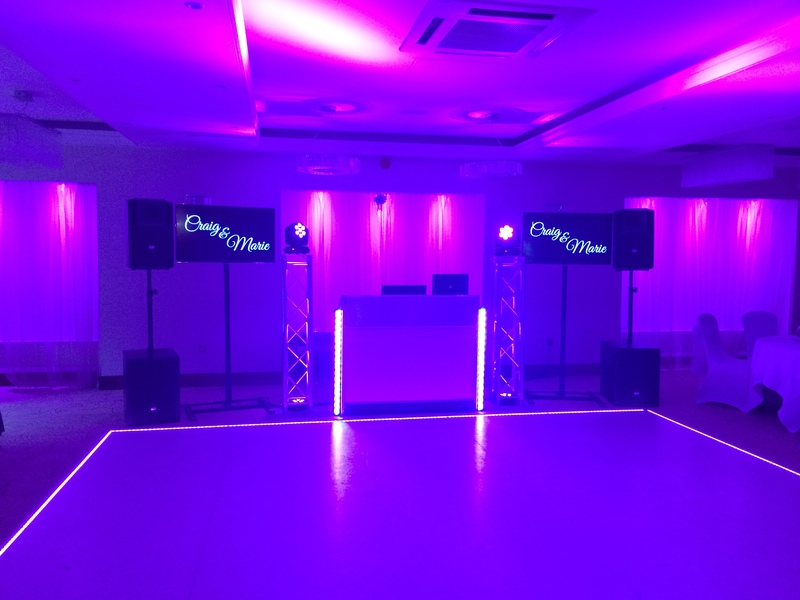 Our carefully selected combination of modern and high-end sound and lighting equipment mixed together with this extensive music library and experienced entertainers will help to get your party started and keep your dance floor busy all night long. 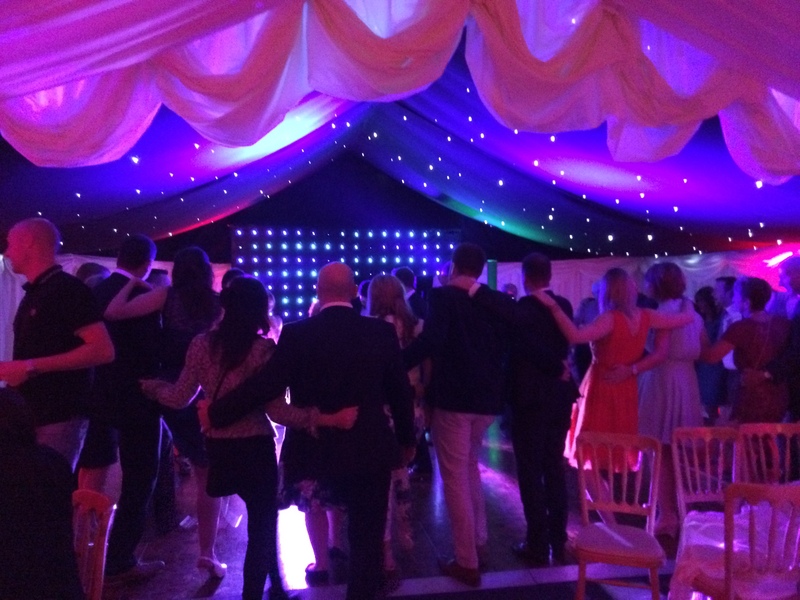 From Children’s Birthdays to School Leavers Balls, Graduations to Engagement Parties, our mobile disco service will provide you with the perfect entertainment to ensure you and your guests have a fantastic evening. 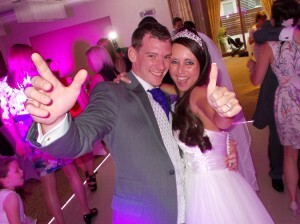 At Disco-Tech we understand that your wedding day is going to be a special time for all involved. For yourselves, it will probably be one of the most important and exciting days of your lives. 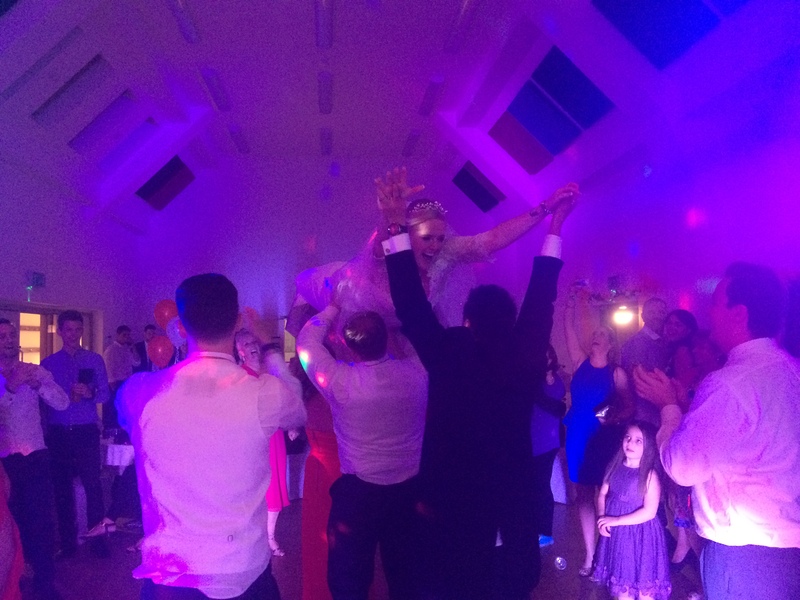 This is why we believe that it is vital that you and your guests enjoy the day as much as possible, from the “I Do’s” at the ceremony to the last song on the dance floor in the evening. 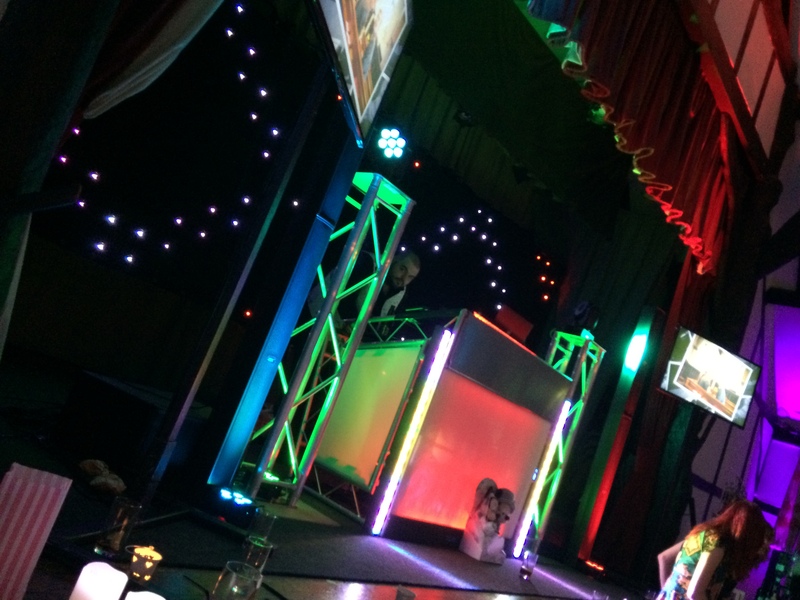 Whether it’s the office Christmas party, the launch of a new product or a after-dinner disco, we have the skills and equipment to make your corporate event really go with a bang! Our feet have finally touched the ground after the wedding. 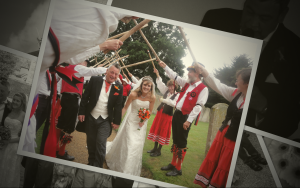 We thoroughly enjoyed our wedding day and was so pleased with the service that you delivered for us. The dance floor was busy all night. It was a great evening and we want to thank you for adding to that. We would certainly recommend you! Sorry I didn’t get a chance to say thank-you last night. 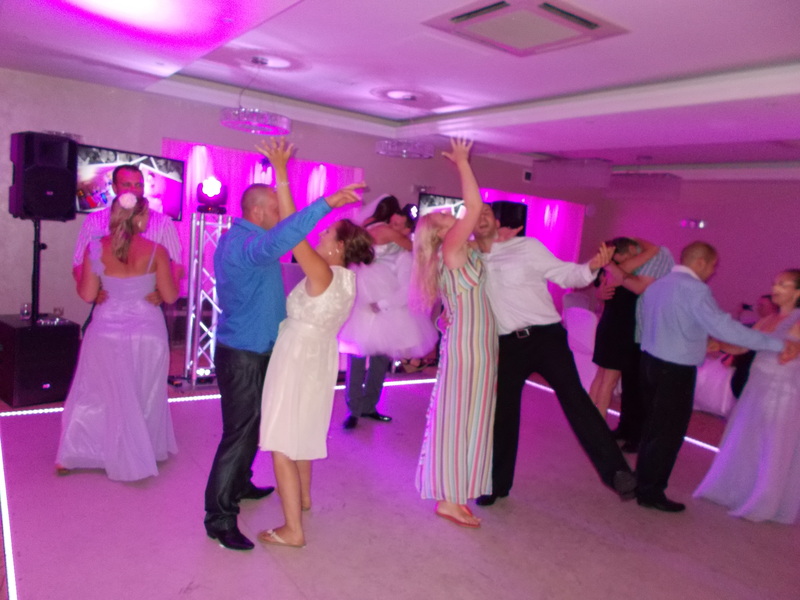 The entertainment was amazing, everyone has said how much they enjoyed it, the DayDisplay was a great addition, as was the dancing to Gangnam Style! We will definitely be recommending you in the future. Thank-you again! 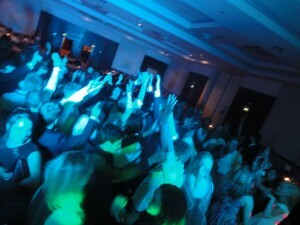 Our ‘Special Something’s’ are designed to complement our discos add to the atmosphere of your evening. If you’d like to add any to your booking then please select it from the options when you get in touch. 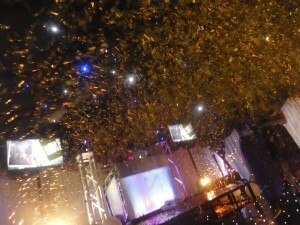 Confetti Cannons are a sure-fire way to start your party off with a BANG! Available in a wide variety of colours and a choice of shapes they can be matched to your colour scheme and party theme. From experience, they also make a great photo opportunity! Why not have one to mark the end of your first dance or the cutting of the cake? RequestList.co.uk is our new white-label solution that enables you to engage your guests in choosing the perfect music to be played by our DJ’s at your event. Together with a password and the date of your event, your guests can gain access 24/7 to request 20 songs each which they would like to hear. Don’t worry too much though… you still maintain overall control of their requests right up until the day, able to add to, delete and comment on all their requests right from inside your master EventPlanner account. Since we introduced ‘DayDisplay’ in 2011 it has become our most demanded addition to all of our packages. For weddings, this simple but effective technology enables you to easily share the memories of your day with all of your guests in a clean and elegant manner. For corporate events, why not share photos or videos of key moments during your year or display messages of thanks to your clients and employees? If it’s a Birthday then why not embarrass yourself and share those childhood photos (that we’d all rather forget) with your friends and family. Thank you for your efforts in making our evening reception a great success. You managed to keep the floor filled and the place buzzing all evening. Plus the look and feel of your service was extreemly professional. Thanks again and we wouldn’t hesitate to recommend you. 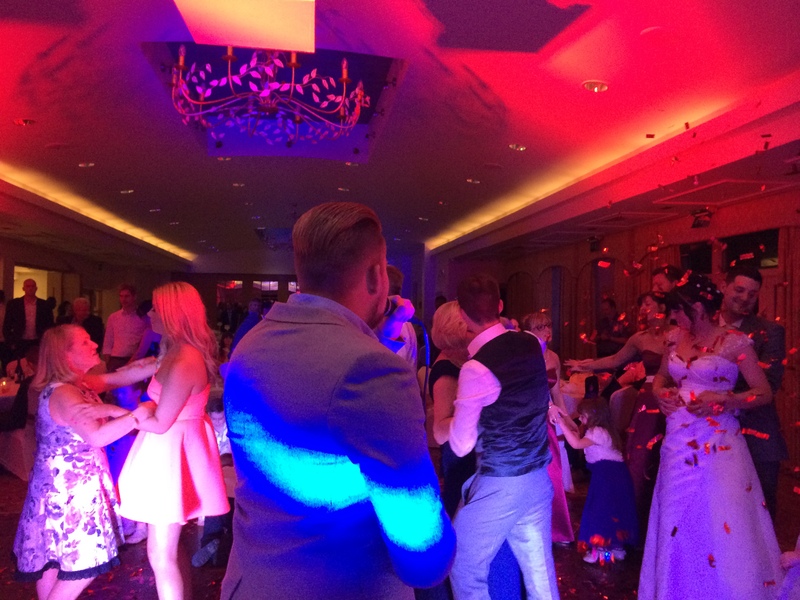 We know from experience that the key to your evening being a success isn’t just based on the equipment that your DJ arrives with or the extent of their music catalogue (The phrase ‘all the gear and no idea’ comes to mind). 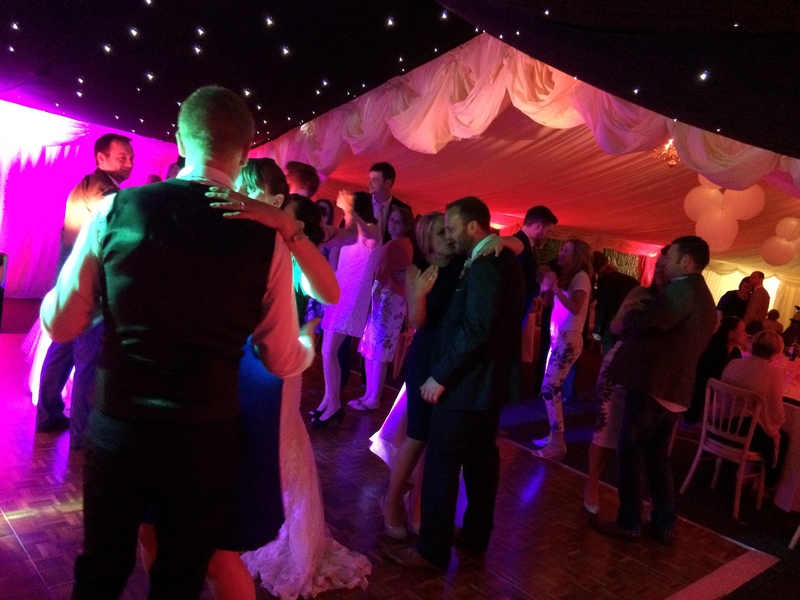 This is why we have worked hard to complete our superb equipment stock and extensive music library with trained DJ’s and entertainers who are committed to make your evening a success. 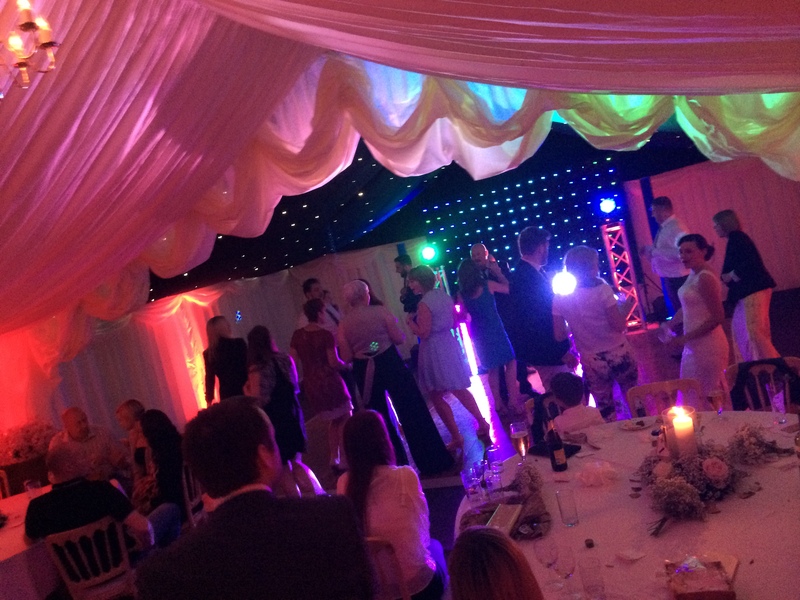 At Disco-Tech we have our own team of professional and reliable DJs who are fully insured and trained from within the company in mobile party entertainment. This means that all our DJ’s have the best type of training available – experience. Arrive on time and perform dressed in our smart company uniform. Behave in a polite, professional and friendly manner at all times. Overcome issues that arise as quickly & professionally as possible. Be friendly and approachable to you, your guests and everyone else involved in your event. Aim to play requests as soon as possible so that you’re not left waiting for your favourite songs. Only ever talk over the music where it is necessary to do so. And on top of all this, our DJs will always do their best to make sure that your celebration is a success. Since humble beginnings in 2003 where rented equipment got us through our early years, we have continually researched and invested in high-end audio and visual equipment to serve our private and corporate clients alike. This has enabled us to build our own extensive (and ever-expanding) library of equipment which we now use to construct the perfect solution for your evening. As standard we operate a multitude of equipment setup options to suit your events individual needs. In the run-up to your evening, your DJ will talk to you about which setup will work best for your venue, your guests and of course you… However, you can rest assured that all of our setup’s share the same common commitments to quality – They Sound Great and They Look Great. Hi Alan, Myself and Steve just wanted to thank you for a great evening. All our guests commented on the great music. It was a perfect day for both of us and Steve’s friends loved the 20 minutes of ska that you provided! I’m sure if there are any parties/weddings in the future you will be the one they all call!! Thanks again! Congratulations on your engagement! Now begins the happy journey to planning your special day. 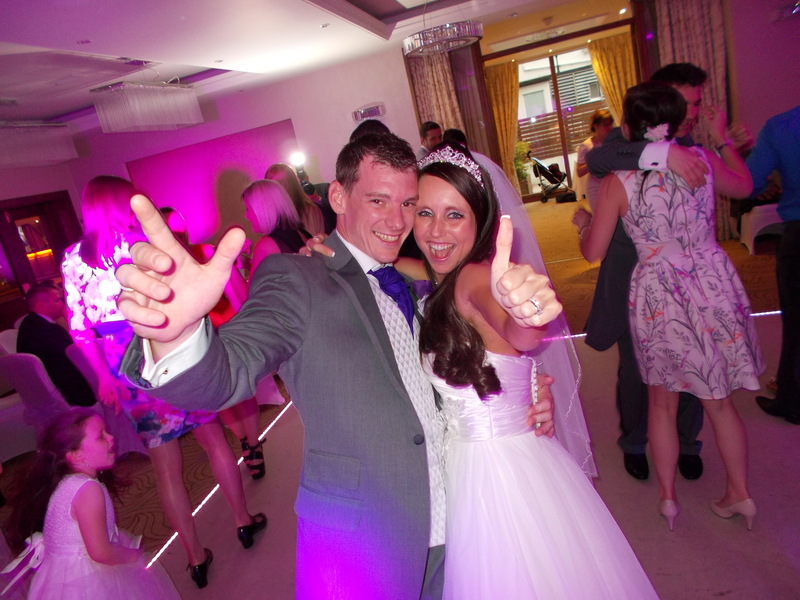 We can provide our services for as much or as little of your wedding day as you’d like us to. 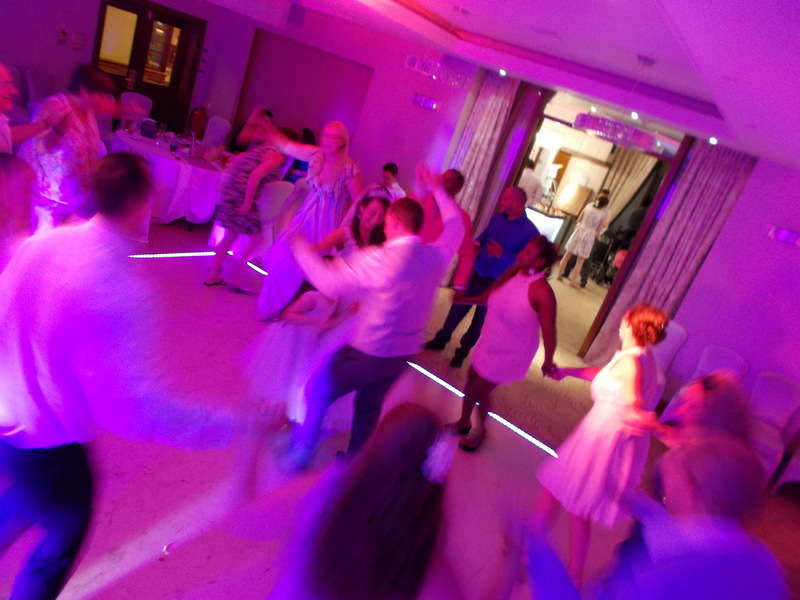 Our most popular package includes gentle background music to underscore your wedding breakfast as well as our stunning wedding disco to take you and your guests through the night. Initial face to face meeting to discuss your day. Gentle background music to underscore your meal. 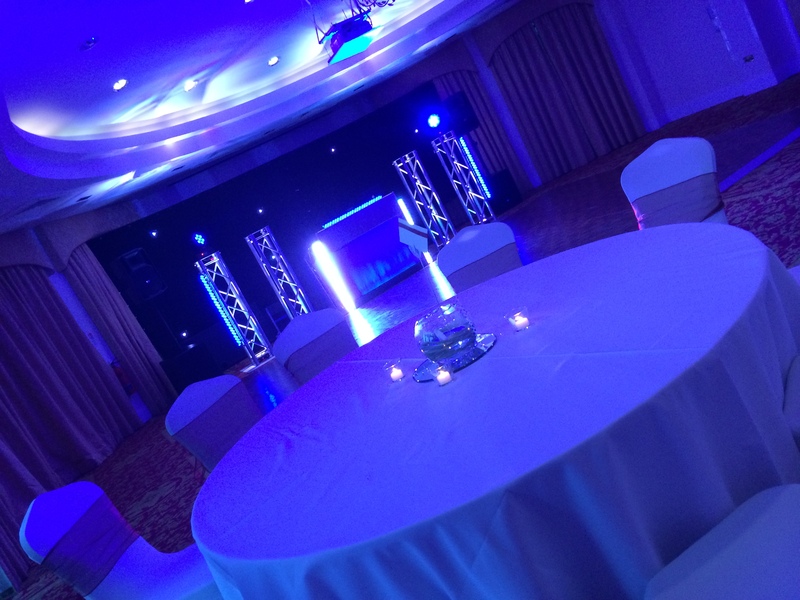 Modern and Attractive Truss-Style DJ Booth. Stylish Full range FBT line-array sound system. 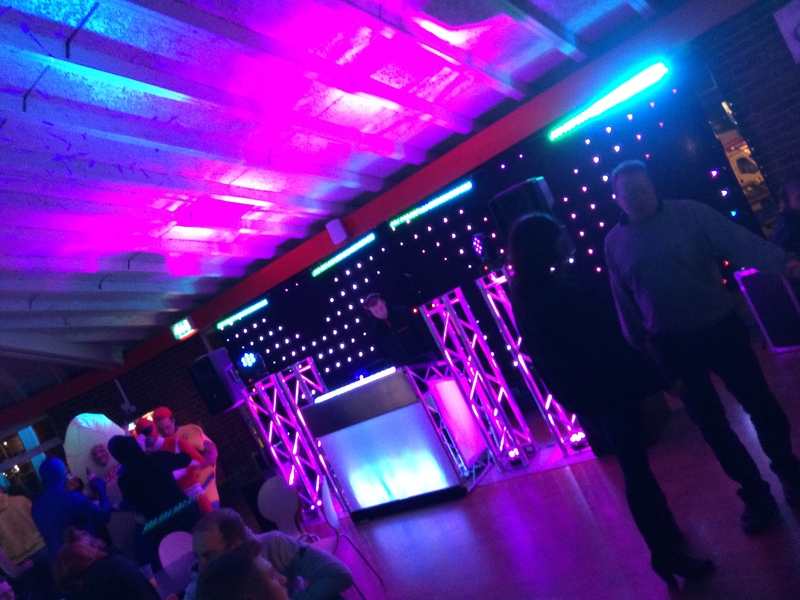 Dedicated DJ for your evening DMX controlled intelligent light-show themed to your colour scheme. Unlimited access to RequestList.co.uk in the run-up to your day. Hello. Just wanted to say a big thank you for making Terry and Pauline’s 50th wedding anniversary party on Saturday night special and a night to remember. They and all the guests had a lovely time. You played a good range of music that suited all tastes and age groups there. People liked it when you stood at the front of the stage and led the dance movements. It got people joining in and giving it a go. People also said how smart and professional you looked, as I did when I first met you when you arrived and were setting up. How you got all that equipment back in the car at the end amazed me. You gave me a card and we’ll definitely recommend you both to anyone who’s looking for a disco. Might have to have a party for no other reason than to hire you! 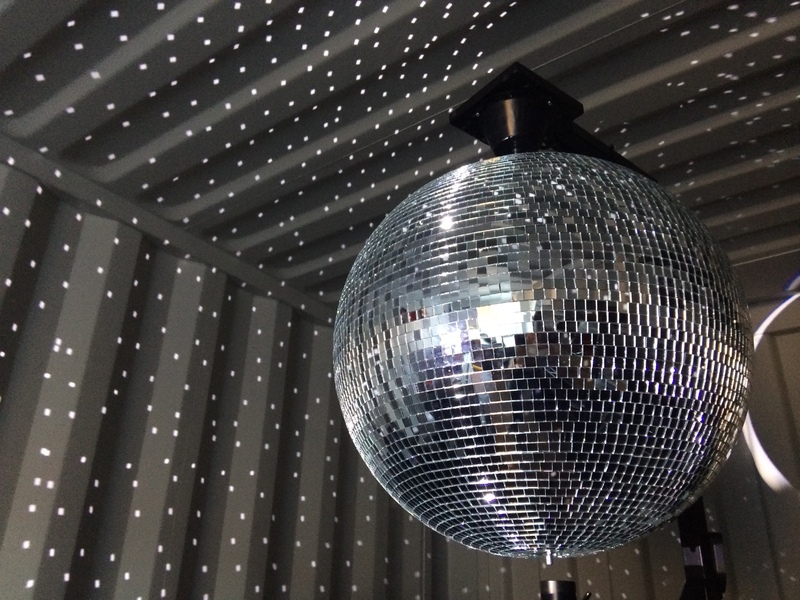 Our classic mobile disco is great for Birthday’s, Children’s Parties, School Discos, Leavers Balls, Christenings or really… any excuse to have a party! 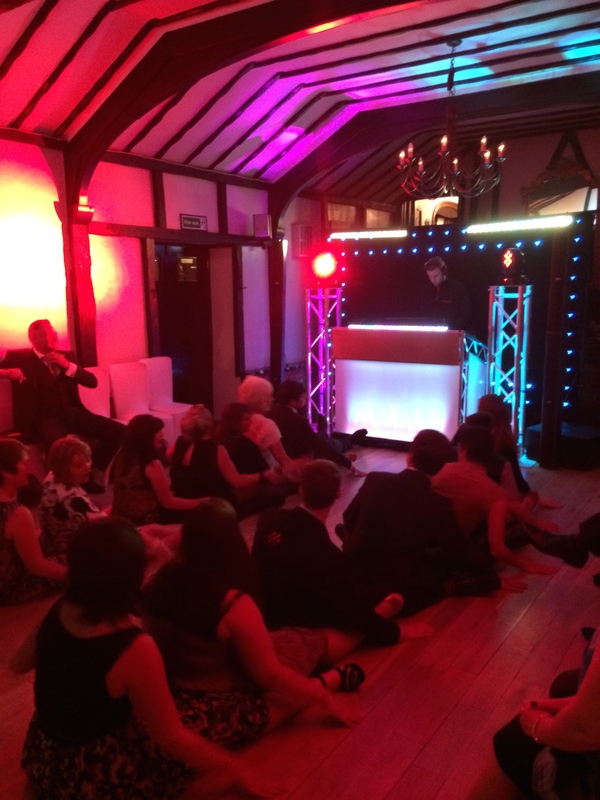 Over the years, our DJs have provided party entertainment for a wide range of ages in many public houses, village halls, marquees and private homes across Kent. We cater for parties of any kind and will tailor our entertainment to the age group of your party to ensure the maximum enjoyment for all your guests. 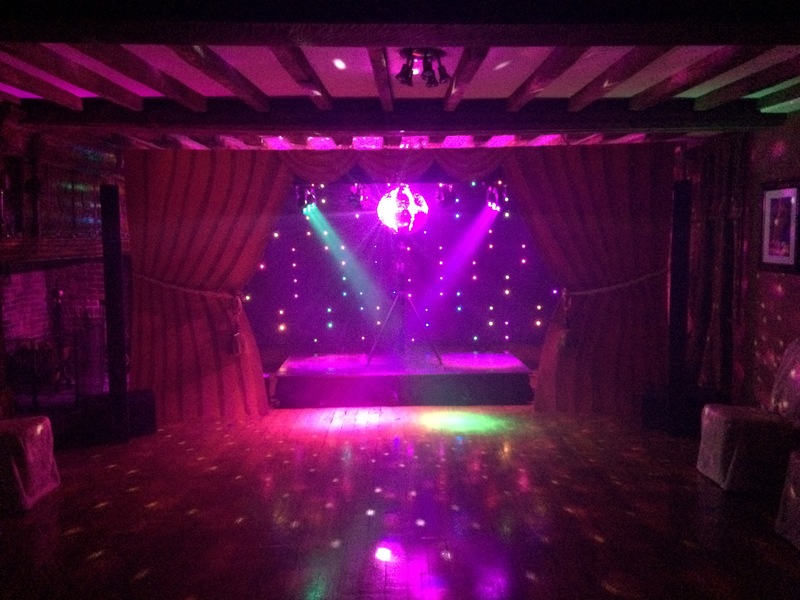 Our vast selection of music from the 50’s to the present day includes all the classic disco tunes right through to the latest chart toppers and our great lighting and sound will ensure that the scene is set for a great party atmosphere all night long! Background music to underscore your guest arrival. Stylish Full range RCF or FBT line-array sound system. DMX controlled intelligent light-show themed to your colour scheme. Unlimited access to your online Event Planner before your event. Option to add our range of ‘Special Somethings’. 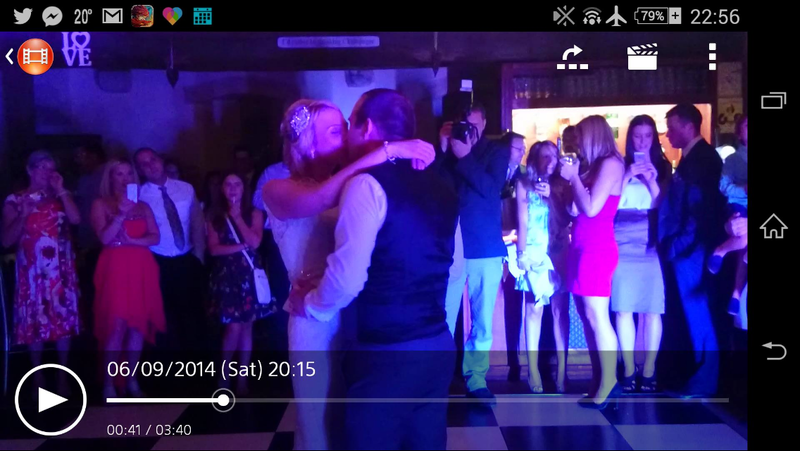 Dear Alan, Thank you so much for doing both our parties, you kept people dancing at both events which was fantastic. My daughter and her friends thoroughly enjoyed her disco with the up to date tunes and brilliant equipment. You made the party! 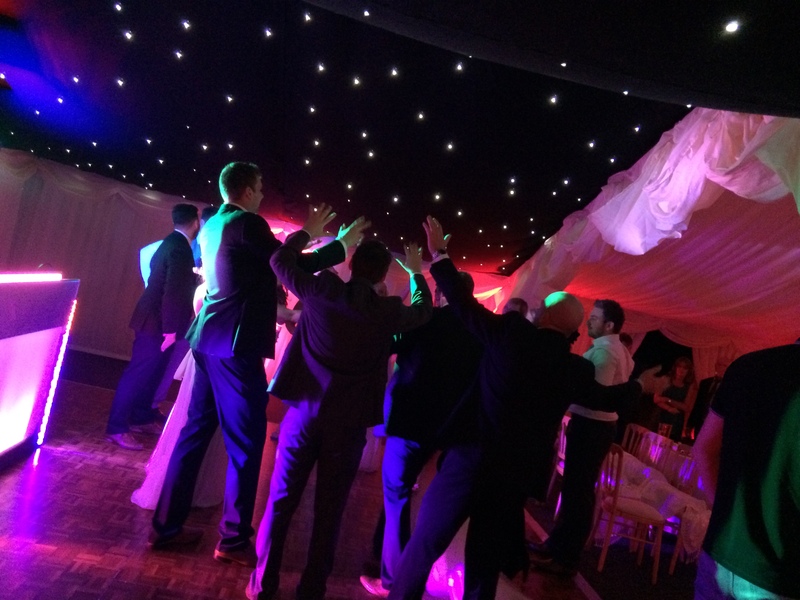 We have experience of providing corporate entertainment for a wide variety of companies across the South East. Utilising our skills as performers alongside our modern and sleek setup designs, we are able to provide an evening that will complement your brand and give your guests a night to remember. Wireless Radio Microphones for speeches/announcements. Dedicated DJ for your evening. Thank you so much for Saturday night, i have had endless people telling me how good they thought you were. 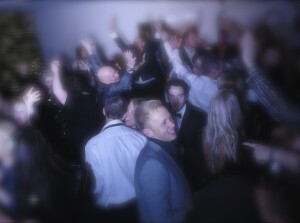 You read my guests perfectly and kept them all on the dancefloor, doing some appalling dancing i might add!!! Thank you again, we could not have asked for anything better!! Everyone has different tastes in music and therefore it would be wrong for us to assume that every party wants to listen to the same music. Because we appreciate this we take care to work with you and your guests to capture the music tastes that you want to listen to. Of course we will discuss your music tastes at your initial client consultation but you don’t have to stop there…. You can then request your favourite songs at any time, any day from the comfort of your own home via our online Event Planner (www.requestlist.co.uk). 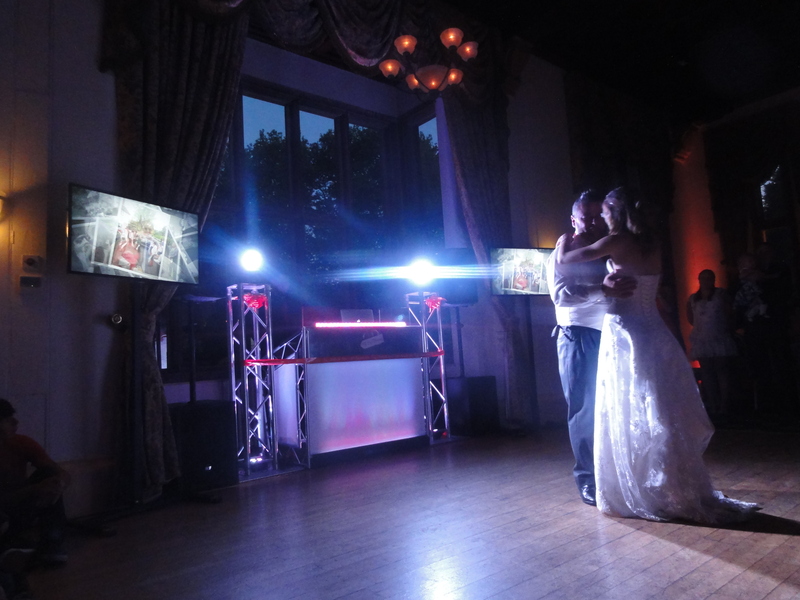 This innovative two part system is available to you from the moment we become your chosen DJs and is a great way to engage you and your guests in choosing the perfect music selection for your evening. 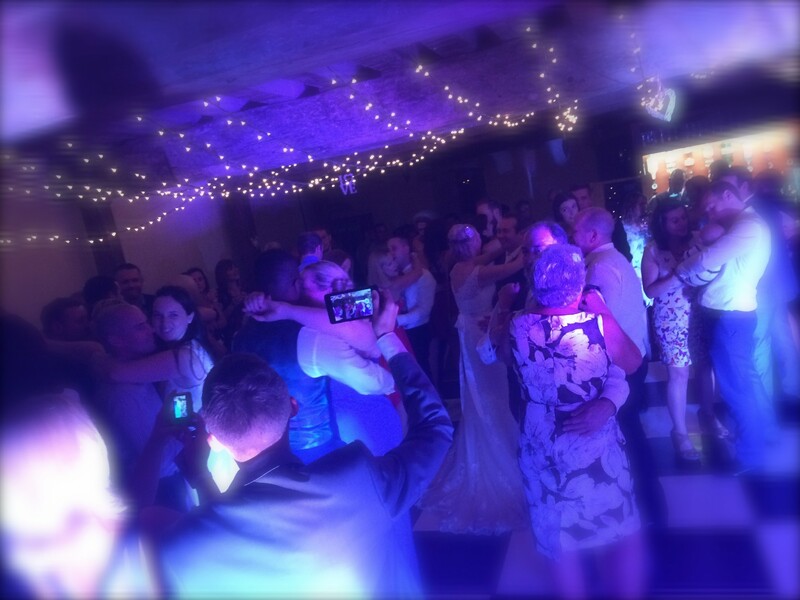 A bit more specialist than this, your account also allows you to narrow this selection down into ‘must play’, ‘do not play’ and ‘play if possible’ categories as well as allowing our wedding clients to choose their all important First Dance’s! We are pleased to hear that you would like to enquire about our services for your special celebration. Please use the short form below to provide us with us much information as possible about your event. This will help us to manage your enquiry as quickly as possible. Prefer to speak to us on the phone? Call Us On: 07748 075070. 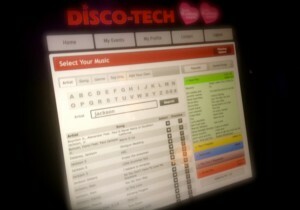 © Disco-Tech - Providers of Amazing Mobile Disco Entertainment since 2003. Copyright Disco-Tech 2003-2015. All Rights Reserved. Manage your booking, make payments and request music for your event.